By Arthi Gopi, Independent on Saturday Newspaper - KRISP atrracts the brightest - Durban is leading the way in DNA research, having attracted some of the brightest minds in the science field, in a new state-of-the-art lab in the city. Durban - Durban is leading the way in DNA research, having attracted some of the brightest minds in the science field, in a new state-of-the-art lab in the city. With cutting-edge technology, such as the next generation DNA sequencing machines, the scientists at the centre, called the KZN Research and Innovation Sequencing Platform (KRISP), are forging ahead in DNA research, with the data collated eventually being able to influence government health policies. Based at the Nelson Mandela School of Medicine, the centre will be officially launched later this year but scientists are already hard at work analysing data. Professor Tulio de Oliveira, of KRISP, an HIV genetic data and bioinformatics software development expert, said the Technology Innovation Agency (TIA) and UKZN signed an agreement for the establishment of KRISP, paving the way for KZN to join a national group of state-of-the-art DNA centres. 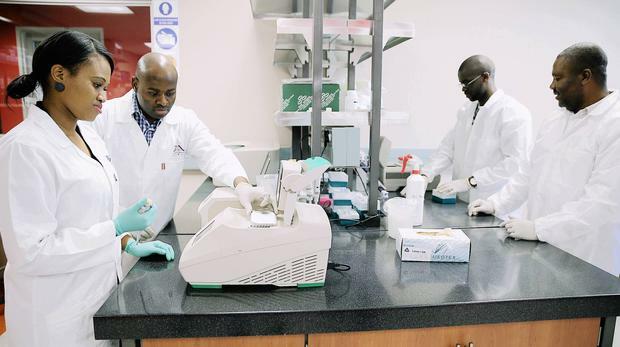 'Right here in Durban, South Africa, we can now produce some of the best, high quality data in DNA sequencing, without having to send it out of KZN or even out of the country for analysis,' he said. DNA sequencing was important because it allowed scientists to see the makeup of a DNA molecule of, for example, HIV in a patient, which allowed them to see how it was transmitted. DNA sequencing also gave scientists a better understanding of how a particular virus, or disease, was affecting a patient, so treatment could be 'tailor-made' for the patient. The facility will allow DNA testing for diseases such as cancer, cases of paternity, and Alzheimer's. 'The work we do here is very relevant to communities. As an example, there is a lot of work going into antibiotic resistance because in 10 to 20 years' time, we may not have any antibiotics, for which drug resistance has not developed' said De Oliveira. The centre has attracted academics, who left the country, to come back to SA, and specifically Durban, in what De Oliveira called a 'reverse brain drain'. One such scientist, Dr Veron Ramsuran, an expert in genetics, was at Harvard in the US when he was lured to Durban. 'I've been looking at HIV from a host perspective and we found surprising results that will soon be published in a medical journal. In effect, we can analyse a host and analyse the virus and determine what kind of treatment would work, it allows us to be very specific in treatment,' he said.